While most people accept credit card bonuses for what they are and some people decide to take advantage of the free money, not everyone thinks earning credit card rewards and credit card bonuses are legit or ethical. I’ve already covered exactly how credit card bonuses work, which also explains how they’re legitimate ways to earn some free money toward your next vacation or financial goal. However, I’d like to now explore why earning these credit card bonuses is not unethical like some people may try to convince you. There is a group of people that get upset whenever anyone uses a credit card to earn a sign up bonus or earn rewards. In these people’s minds, they see the person earning the rewards as damaging others. Credit card companies make money in a few ways. One way is through the interest people get charged on the balances they carry. Another way is through the fees credit cards charge the stores we all shop at to process credit card transactions. People that believe earning credit card rewards and bonuses is unethical believe that those who use credit cards for rewards add unnecessary costs to the credit card companies. These people believe that credit card companies then must recoup the costs from vendors with higher processing fees or from other cardholders by charging higher interest rates. When it comes to earning sign up bonuses, some people think it is unethical because they feel people are taking advantage of the banks. If a person successfully earns a sign up bonus, tries out the card to see if they like it and uses the card without paying interest or fees to the bank, that person may feel uncomfortable as if they beat the system. The haters do have a point. Credit card companies do charge processing fees as well as interest to those that carry balances. However, both of these things would happen anyway. Earning rewards or bonuses based on this activity isn’t really changing anything. The processing fees and interest rates will still be around whether credit card rewards exist or not. Most businesses today accept credit cards as a form of payment and figure any cost of processing those transactions into the prices of their products as a cost of doing business. There will always be people that use credit cards because they need access to the credit, not the rewards. Companies don’t want to turn this business down. If people stopped using rewards credit cards, businesses wouldn’t suddenly stop accepting credit card payments. They wouldn’t remove the cost of processing credit card transactions from the prices of the items we buy every day, either. On the other side of the issue, people that carry credit card debt on rewards credit cards do usually pay higher interest rates than those who use credit cards without rewards. However, it isn’t my problem that consumers don’t make smarter choices. If someone that was carrying credit card debt on a rewards credit card simply used a different credit card with a lower interest rate whenever they needed to carry a balance, there would be no issue at all. When it comes to earning sign up bonuses, it’s important to realize that no one is taking advantage of the banks. Banks offer these bonuses because it’s proven that they’ll end up making more money per customer than the cost to acquire that customer with a sign up bonus. Yes, a few customers may be unprofitable to the bank, but overall they’re still making money hand over fist. Just because you were smart and didn’t pay the bank interest or fees doesn’t mean you did anything wrong. In fact, you still made the bank at least some money on the processing fees for any transactions where you used your credit card. I strongly believe that you should take advantage of these credit card sign up bonuses and rewards offers. Sign up for the cards you want to try out and earn the bonus or regular rewards. You may find you like using many of these cards and receive enough benefits to keep using them as I do. If you’re looking to earn a sign up bonus or get a better rewards credit card, check out my list of the best credit card sign up bonuses which I update every month with the latest and greatest deals. If you’re looking for even more inspiration, check out our travel tips and tricks page for a list of our personal trip cost reports for our vacations along with other tips on how to get free or heavily discounted travel. 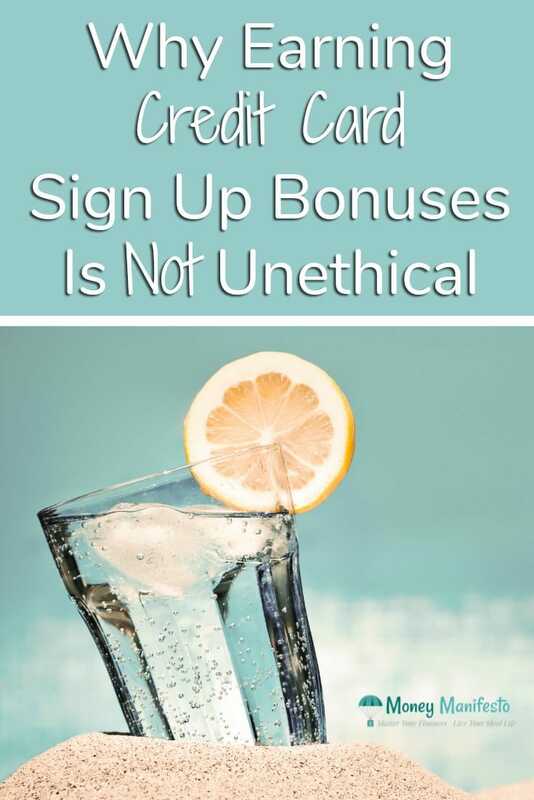 Do you think earning credit card rewards and sign up bonuses is ethical or not? I’d love to hear your thoughts or any questions you may have on the matter in the comments below.